Get ready for warmer weather right now at Mark’s Canada. Shop now until May 23, 2016 at Mark’s Canada and save 30% off original prices on all shorts and capris. Plus save an extra money with printable coupon. You can save $10 off your purchase of $50 or more. 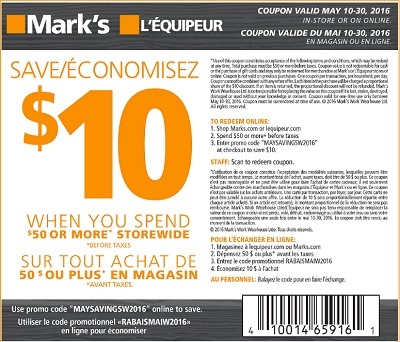 This offer is valid with printable coupon at Mark’s Canada stores or online with promo code MAYSAVINGSW2016 (enter it at checkout), until May 30, 2016. And if you spend more than $99 you can enjoy a free shipping on online orders. Official source of the information is Mark’s Canada.